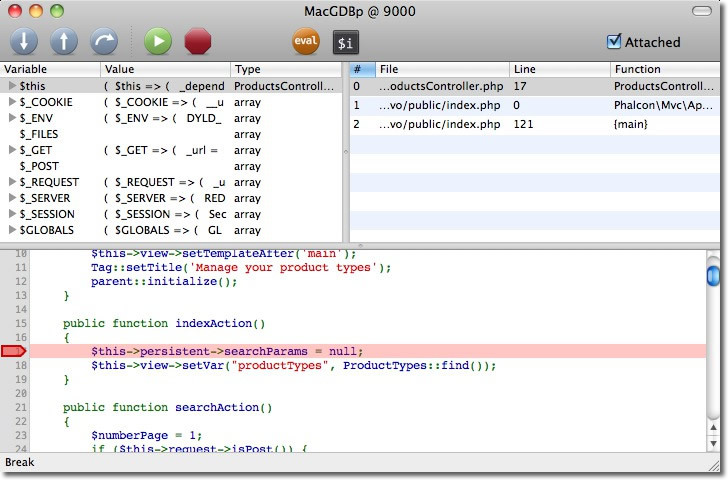 PHP offers tools to debug applications with notices, warnings, errors and exceptions. The Exception class offers information such as the file, line, message, numeric code, backtrace etc. on where an error occurred. OOP frameworks like Phalcon mainly use this class to encapsulate this functionality and provide information back to the developer or user. Despite being written in C, Phalcon executes methods in the PHP userland, providing the debug capability that any other application or framework written in PHP has. Any exception thrown within the block is captured in the variable $e. A Phalcon\Exception extends the PHP Exception class and is used to understand whether the exception came from Phalcon or PHP itself. As you can see from the above output the Phalcon’s classes and methods are displayed just like any other component, and even showing the parameters that were invoked in every call. The method Exception::getTrace provides additional information if needed. Phalcon provides a debug component that allows the developer to easily find errors produced in an application created with the framework. Any Try/Catch blocks must be removed or disabled to make this component work properly. XDebug is an amazing tool that complements the debugging of PHP applications. It is also a C extension for PHP, and you can use it together with Phalcon without additional configuration or side effects. Once you have xdebug installed, you can use its API to get a more detailed information about exceptions and messages. Xdebug provides several ways to get debug and trace information regarding the execution of your application using Phalcon. You can check the XDebug documentation for more information.